Jennifer Koh employs J.S. Bach as the point of departure for solo concerts that include newly commissioned works. The 21st-century solo recitalist juggles many considerations when planning a program. It has to be something special. But it also has to be grounded in the repertoire in such a way that there’s no chance that anyone will leave unsatisfied or confused, something that many champions of contemporary composers have learned the hard way by playing to empty seats. At the top of the musical profession are those rare artists who not only manage to reimagine and revitalize the standard repertoire but also are capable of introducing new music without compromising the integrity of that experience either. Jennifer Koh, the violinist who will appear in solo recital on Wednesday, April 24, at the Music Academy’s Hahn Hall thanks to UCSB’s Arts & Lectures, has mastered that delicate balancing act in her ongoing series known as Bach and Beyond. I spoke with Koh by phone from her home in New York City about the upcoming concert in Santa Barbara. The two Bach pieces on this program are both numbered one — the Sonata No. 1 in G Minor, BWV 1001 and the Partita No. 1 in B Minor, BWV 1002. Why did you choose two first works from Bach? The whole program is about beginnings. These are all first works for solo violin — not just the Bach. The Bartók sonata is, as well; even the new commission — Phil Kline’s piece Dead Reckoning — is his first composition for solo violin. What was the logic behind bringing these first works together? What appealed to me about putting these works on the same program is that, together, they give access to the idea of becoming. I’m reminded of how interested I was when I saw the first films of my favorite directors. Whether it was the Coen brothers or Lars von Trier, seeing their first films showed me something really important about them; it’s like our first steps reveal the kernel of who we are. The Sonata for Solo Violin, Sz. 117 of Béla Bartók is also on the program. It’s certainly a challenging piece for any violinist to perform. What can you say about your approach? It’s deceptive because the Bartók can sound relatively simple at times, but the structure of that piece? It’s mind-boggling. I’ve revisited it quite a few times in my career, and I’m currently performing works from the Bartók in both the duo and the concerto settings, so I suppose you could say I’m in a Bartók phase. Help, I’m in Bluebeard’s Castle. [Laughs.] Seriously, the thing about Bartók is that, like Bach, his music never gets old. He never sounds dated. Bartók wrote very comprehensively for the extended technique of the violin, and he was one of the first composers to do so. He was a pianist, and he really wanted to stretch the sound palette for every instrument, especially the violin. This is the second of your Bach and Beyond solo tours, in which you perform very strenuous solo programs from memory. What drives you? My friends and colleagues do sometimes ask me, “Why are you doing these?” The preparation is incredibly demanding. Every performance requires equally huge measures of mental focus and physical endurance. And there’s no one else onstage to lean on — there’s no piano, no net. But I love it, and the 92nd Street Y came through as a sponsor and a home for the whole three-part series; when they partnered with me on the commissions, I felt like it had to be. 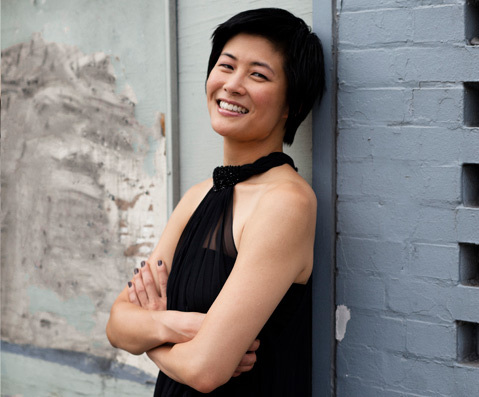 Jennifer Koh, Bach and Beyond Part II, will be presented by UCSB Arts & Lectures at the Music Academy’s Hahn Hall on Wednesday, April 24, at 7 p.m. For tickets and information, call (805) 893-3535 or visit artsandlectures.sa.ucsb.edu.